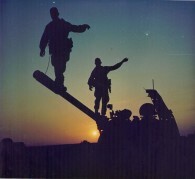 Sunset on Desert Storm For these soldiers, who are walking on the gun tube of a destroyed Iraqi tank at dusk, this isn’t a 1080 pixel screen; it’s the memory of a lifetime. Buttoned Up During the Fighting Fighting when you are buttoned up in an armored vehicle reduces your feel of reality by at least half. Looking through a periscope, vision block, Blackberry, iPhone, or even a computer screen limits your field of vision. Getting outside these confines, opens up your imagination and overall perspective on reality.